We are all about setting our clients up for success with their wedding day timeline! 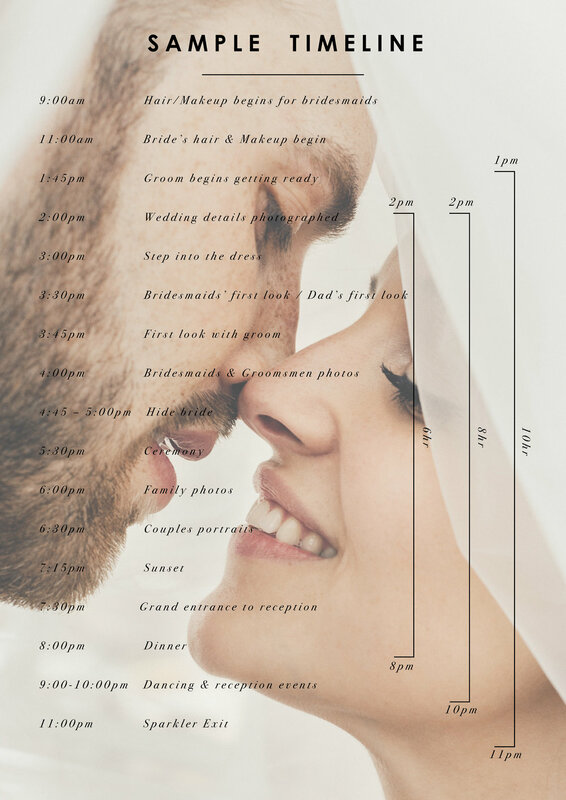 We created this Sample Timeline to give brides and grooms an insight into the wedding day planning from the photographers perspective. We encounter so many engaged couples who both anticipate and dread their engagement photos. 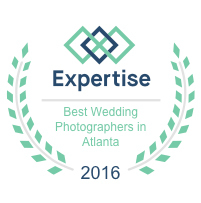 They anticipate them because they’re looking forward to a special portrait session celebrating an exciting time in their lives. But at the same time, they dread their session because they worry that they’ll look awkward in front of the camera. Luckily, we think you can easily overcome the nerves that come with being in front of the camera by utilizing a few of our suggestions! 1. Focus on each other! Our first tip is to focus on your fiancé and the connection you share with one another. Be as affectionate towards each other as you feel comfortable -- after all, this is a shoot to show off your love! Hold hands, kiss, cuddle … do what feels right to you! Remember, there’s no rule for what’s right in your engagement shoot! At first, you may feel nervous or uncomfortable in front of the camera, but chances are your fiancé feels the exact same way! Laugh through the awkwardness together and your connection will shine through. 2. Take your engagement photos while doing something you love! 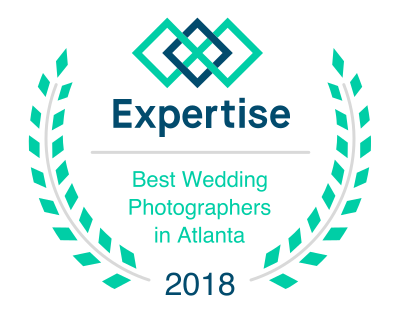 Another great way to loosen up and look more natural in your engagement photos is to have them taken while you're doing something you love together! Maybe you enjoy cooking or gardening, or perhaps hiking or dancing is up your alley. Whatever is special to you two -- do that! Doing a shared activity that you both love will make the shoot feel authentic to who you are as a couple, and it will also give you something to focus on that isn’t the camera. For more ideas of how to let your identity as a couple show though, check out our tips on making your shoot personal! 3. Make the poses your own! A good photographer will suggest poses throughout the shoot, but feel free to make adjustments to these poses to make them your own. If the way you are sitting or standing feels uncomfortable or awkward to you, switch it up! Feeling comfortable is key to looking natural. Also make sure to be aware of what you’re doing with your hands while you pose. They shouldn’t be hanging awkwardly by your sides -- after all, when do you ever stand that way in real life? So always make sure to be doing something with your hands and arms. For all you girls -- try touching your hair, playing with your clothes, or holding your fiancé’s hand. For guys -- put your fingers or thumb in a pocket, or better yet, love on your girl! 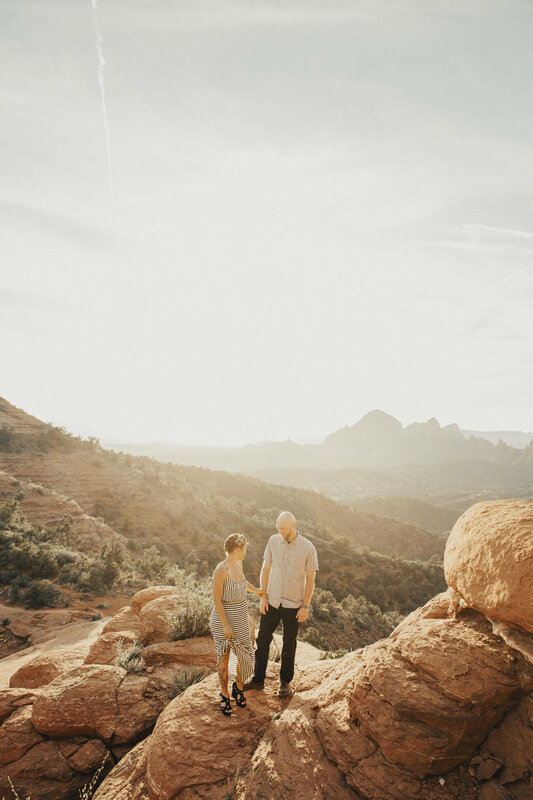 We hope you find these tips helpful, and that when you take your engagement photos your authentic selves shine through! No matter what, remember to have fun with it! If you’re enjoying yourselves, looking natural will be an automatic result!